That there [Howmuch?] has found treasure. He actually found it in a charity bookshop in Lichfield, but his golden find actually pointed to a farmyard near Grove Hill, near Lower Stonnall/Thornes, in 1824. There was bronze in that there hill. 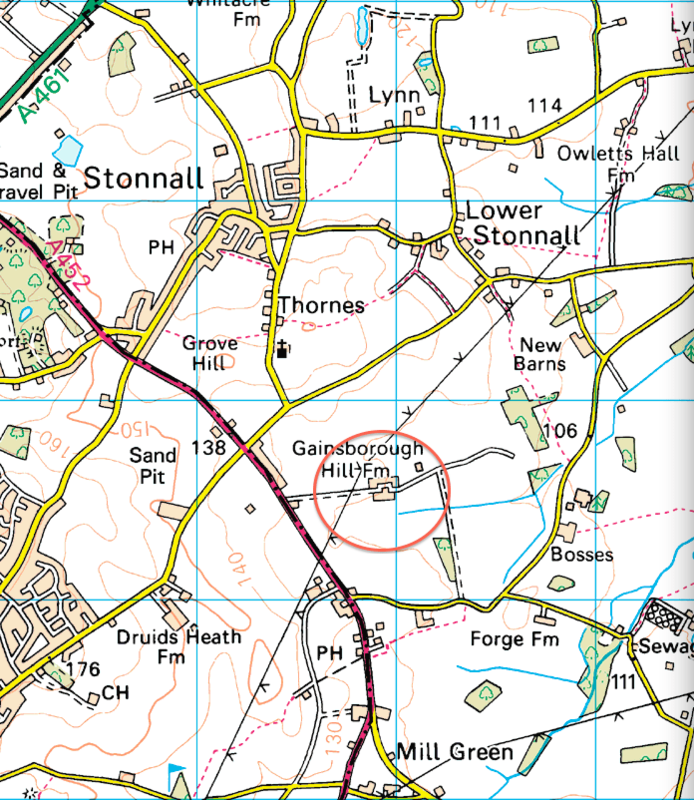 The location of Gainsborough Hill Farm on modern Ordnance Survey 1:50,000 mapping. What our intrepid trawler of the history record found was that on the 12th of February, 1824, farm labourers extending a rickyard at what is now Gainsborough Hill Farm, excavated what was considered in 1967 to be the most significant Bronze-age discovery made in Staffordshire. The find included human remains, spearheads and other objects. What’s most remarkable is that the fate of the entire hoard is apparently still unknown, presumably nicked. The find appears to have been made under the right hand limb of the uppermost, ‘L’ shaped building on the Google image below. [Howmuch?] found all this out after he purchased an interesting, but nondescript-looking secondhand book for the princely sum of £2. It was the book of Transactions for 1967-8 of The Lichfield and South Staffordshire Archeological and Historical Society. These volumes were like an ‘Annual’, and are still published today. Unassuming… but dynamite. Click on the image to download the PDF file. …I remember a geography lesson many years ago where we were told of the remains of an ancient prince being discovered in a field near Stonnall complete with grave goods – where has this find disappeared to? The paper I feature here is a fully referenced, academic (but easy to read) description of the find, it’s nature and appearance. It was written by David Coombs with an introduction by Lily F. Chetty, O.B.E., F.S.A. In short, it’s everything known about what must have been the first Staffordshire Hoard, and it’s a remarkable thing indeed. I have scanned the paper in question (and I’m well aware that from the included contents list, some local history types may want others scanning, so just shout up), and I present it here to read and discuss in PDF form. The fate both of the objects found and of the original drawings is unknown and enquiries made by Mr. J. T. Gould, F.S.A. (in preparation for his Men of Aldridge, 1957) have so far proved fruitless. ‘Father Frank’ addressed an enquiry on the whereabouts of the hoard to the Birmingham Weekly Post, 9 August 1879, but no reply is recorded. Even in 1824 no owner of the hoard itself was specifically named, neither is it clear whether the actual bronzes were submitted to the Society of Antiquaries or only drawings of them; there is no record that either were exhibited at the meeting of the Society of Antiquaries on 1 April 1824. In 1860, Miss Bracken quotes from correspondence communicated by Major Tennant, but at the end of the list of drawings she states that ‘These are in the possession of Captain Tennant, R.N.’ From William Hamper’s letter it could be inferred that the implements found were the property of William Tennant (of Little Aston, Aldridge, Staffs.) as owner of the estate and that they had been sent by his permission for Dr. Meyrick’s examination. Indeed, from Meyrick’s description of the two ‘cylindrical boxes’ Nos. 10 and 11 , one might assume that he was handling the objects themselves, while in referring to the sword No. 1, he mentions rivet-holes in the hilt of the dagger which are not noted by Hamper; likewise the long ferrules Nos. 5 and 6, ‘the hollow rod of office broken in two.’ His suggestion that specimens should be engraved for the Society of Antiquaries was apparently not followed up. This is a remarkable paper, and I’m immensely grateful to [Howmuch?] for both spotting it and letting me scan it for you readers. I look forward to the discussion that will hopefully ensue. I know this will be of use and interest to the Stonnall historians – like the aerial photos featured here previously. Please feel free to download and discuss, but please, Julian, if you want to use it, grow a set of balls and give credit for the origin. Lichfield District Council were good enough to donate the aerial photos you clearly found so useful recently, the least you can do is credit Gareth Thomas who went to the rouble of scanning them and sending them to the blog. Thanks. This entry was posted in Brownhills stuff, Environment, Events, Fun stuff to see and do, Just plain daft, Local Blogs, Local History, Local media, News, Reader enquiries, Shared media, Shared memories, Social Media, Walsall Wood stuff and tagged 1824, Archeology, Bronze age, Brownhills, Brownhills local history, burial, David Cooms, Events, Find, finds, Gainsborough hill Farm, Greenborough, Hoard, Lichfield and South Staffordshire Archeological and Historical Society, Lily Chetty, local blogs, Local History, SGrove Hill, Shire Oak, Silly, Staffordshire, Stonnall, Things to do, Walsall Wood. Bookmark the permalink. Wow. Just trying to let that sink in. How is this not better known? And of course, where on earth are these objects now? The objects are probably buried in the bowls of a museum somewhere in the uk. I found a small Hoard of bronze and flint tools just outside of Lichfield a few years back. Last September i called up the FLO (Finds Liaison Officer) for our area. They came to my home and collected it then took it away for study. That was the last i heard about, or laid eyes on it. That was 14 months ago. i know of a few Hoards that have turned up in Staffordshire over the last 2 years. The metal detectorists who find these objects declare them to their FLO. The FLO will then take them away for valuation and study, Its usually over a year before the finder gets to hear what has happened to the find. I would wager that there have been a fair few undeclared finds for fear of having them taken away never to be seen again. Most detectorists, are not in the hobby for financial gain, they just want to find something that may change or add to our history. It would be great if this burial and goods were available for us to look at, and maybe some day it will be. Hi Warren, I was going to say how great I thought the PAS was, and how it’s existence hopefully means that things are properly recorded these days to avoid situations like the lost Stonnall Hoard arising. However, I only know about it in theory, so it’s interesting to read your experience, as someone who has real life dealings with it! I was having a quick look, as I know nothing about the bronze age, and found this small collection of finds from Knowle Hill, Lichfield at the British Museum, which includes a Bronze Age anvil. Another hill…. Also Bob, I agree that those L&SSAHS transactions are brilliant resources. Thanks! I too have my hands in finding parts of two Roman Hoards last year. First was 33 bronzes of around 330AD, the second was 14 silver denarius of the 2nd century AD. Both hoards are at the British Museum at the moment. The FLO at Birmingham Museum is very helpful with anything that the general public finds that is over 300 years old. Both hoards are from South Staffordshire. I have to agree with Warren, the FLO’s do a great job of recording and dealing with finds made by the general public. But they are seriously over worked, one officer for the West Midlands and Stoke! I known about this particular hoard for sometime via owning to said publication. I susspect that as with anything found in the early 19th century it ended up in a private collection only to be lost or sold to other private collects once the owner had past away. Sad really, but a fact of life. Many early finds have disappeared this way, its lucky that we have a paper record at all as most such finds ended up in the pockets of poor Ag. Labs. to be sold for beer money. I’ve got that one! I didn’t know that it wasn’t “known” – which just goes to show that sharing more rather than less in such excellent forums as Bob’s World is a GOOD idea. Well done Pedro and Bob for putting it out there. Anyway, the Lynn & Stonnall Conservation Society were obviously in the loop….their recent “Discovering Stonnall” quotes a contemporary account from Miss Bracken’s “Forest and Chase of Sutton Coldfield” – “on the 12th of last month as some labourers were moving earth from the side of a hill at Greenborough [sic] Hill Farm at Lower Stonnall, they discovered about six feet below the surface, a grave cut north and south in the sand rock, and shaped like one in a churchyard. Fragments of human bone, or decayed wood about the size of two hands were all that the excavation contained and within a few inches of the west side were found lying the in the loose sand two swords, some spearheads, celts (chisel edged prehistoric tool) and several other relics, all of bronze. The large sword ad spearhead and a celt appear to have beeb broken by main force, probably when the remains of the warrior were committed to the peaceful sepulchre” I’m just wondering what other treasures are in Miss Bracken’s book, of which I think I have a copy….. I see that Ros said “Bronze Age, though stone….” L&S Conservation and Historical record it as Stone Age. Sorry, should have said to that the “Big Field” belongs to Owletts Hall Farm, visibly nearby on Bob’s first map. a huge thanks to Howmuch and to yourself for putting this on the blog. The comments already posted and their links, too. Fascinating, and quite possibly the start of something very, very important! Also, just the other side of the Chester Road is the fort, related I think. In the last two years, I know of part of a bronze age dagger and at least two iron age gold coins being found not that far away to the north. There was anchant activities in and around the area with the odd find, metal and stone turning up. Don’t forget the worked flint bed behind the Nursery on Bourne Brook. May i add that when the toll road was driven through, they discovered a prehistoric ring ditch. It was located on the Stonall side of the A5, opposite Wall. It was at least 50 meters across and was excavated by Phill Harding of time team fame. i think the ground above it was built up and the toll road run over the top. It is therefore preserved for future generations, maybe when we all have flying saucers and the roads are no longer required. i know there has been a hoard of Bronze tools found at a farm on the Birmingham road where it leaves the A5 and A38. It looks like the whole area is alive with prehistoric finds, and the Romans who built wall were just continuing with the occupation of the land. Nice find Howmuch and Bob. Very intresting read. Thank you. Perhaps someone needs to re-evaluate the area. Letocetum, the Brownhills Hoard, Knave’s Castle and Castle Hill, the finds at Gainsborough Hill…. There’s a lot going on round here, mostly ignored. Valid point Greame, i do think we had a very active tribe based local to wall. “”Relics dating back 3,000 years have been unearthed during work on a new motorway near Birmingham. The discoveries were made by archaeologists working alongside the construction teams on the Birmingham Northern Relief Road (BNRR). Their finds have included Bronze Age charcoal mounds, an Iron Age settlement and a Roman farmstead. All removable items are being taken away allowing work on the 27-mile-toll road to continue. They will eventually be displayed in museums. Previous discoveries along the route of the BNRR have included a medieval fishpond at Wishaw, Warwickshire, and a Roman burial ground containing 50 cremations at Wall, Staffordshire. Dr Mike Hodder, planning archaeologist for Birmingham City Council, described the finds as a “major discovery”. He said there had been previously been strong evidence of Bronze Age settlement in the area. But little had been known about the Iron Age. Dr Hodder told BBC WM: “”These are very important new discoveries of Birmingham’s very earliest period of history. I have a feeling that Lanes farm holds a few secrets in its top soil. I have asked Mr Lane on many occasions if i can have a few hours detecting on his land, however he is vehemently against it. I t won’t stop me asking him again though. You never know there may be a piece of history changing evidence just waiting to be found. Every year the plow diminishes these artifacts worth and quality, until one day it will be unrecognizable and worthless. Writing in 1860 in the book The History of the Forest and Chase of Sutton Coldfield, L Bracken quotes the very same letters as shown in the booklet, and could well be the source of the Society Volumes. However no knowledge is given to as to where the articles ended up. Nice to be exonerated, Bob. It was indeed me who wrote to the Walsall Advertiser . As alluded to I was first made aware of this mysterious find by my geography teacher, Graham Sims, who lived in the Stonnall area and the year would have been circa 1967. He mentioned that the find had revealed the burial with grave goods of what he called a Bronze Age Prince still wearing his regalia! I presume he must have read or been made aware of the article you mention. It wouldn’t be the first time history had made a monkey out of me, and I doubt it’ll be the last ;-). However, I still believe in the point of the original article – I know it’s fun to speculate, and that’s what it’s all for, after all. But some of the wild guesswork surrounding the Hoard and it’s history I see is bonkers. The whole point of the shock and rarity of it is that it has so little clue to it’s history, and unless more comes to light, I think we’ll never know with any certainty. It would also be interesting to know what became of the ‘finds’ discovered at Catshill when cutting the canal!!! Especially given its close proximity to where the Saxon Hoard has been discovered! What I do know for certain – is that this area has a much more interesting ancient history than many gives it credit for. 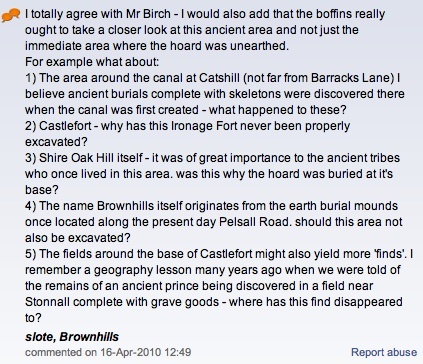 Perhaps we ought ask the Time Team crew to do some investigating – starting with a professional ‘dig’ at Castlefort! Wish I had had just an inkling of this during the 17 years I was teaching in Shenstone during which time I was led to many and various fascinating local historical stories. Not this one though!